The most romantic day of the year is about to arrive: Valentine’s Day, the day that is dedicated to those who are in love. If it’s true that love is celebrated every day, in the little things, then it is also true that every once in a while promises are renewed with a special thought for our loved ones. A small thank-you for our partner because they are always at our side, supporting us and accompanying us in every challenge that life presents. What better occasion is there, if not the day of lovers, to surprise your partner with an original gift? A small but precious thought, that will always remind him or her how special they are to us, every day. A thought to carry with them every day, because it will make them feel close to us always. This is why we have designed a selection of romantic jewellery for those who are looking for the right inspiration to choose a special Valentine’s Day gift for their partner. Whether for him or for her, our Nomination bracelets celebrate love with symbols, letters and romantic inscriptions to dedicate to your loved one to show them how important they are. 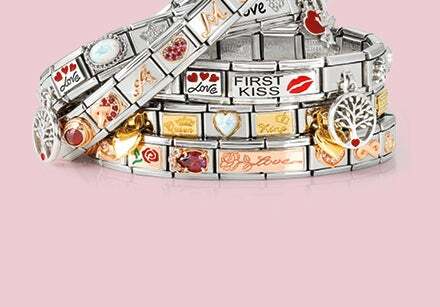 Charms and heart pendants decorate these elegant bracelets to give to a special woman, who can wear them every day for any occasion, and always carry a note of tenderness with them. For the man with whom you share all of life’s adventures, you can choose to create a unique and original bracelet, thanks to the Composable Links with symbols that best represent love. A highly symbolic piece of jewellery, which can light up the eyes of every woman who receives it: what are we talking about? The ring, of course, the most romantic of all jewellery pieces, to dedicate to your loved one. Valentine’s Day 2019: the perfect moment to choose an important gift for the woman who supports you every day and on all occasions in daily life. 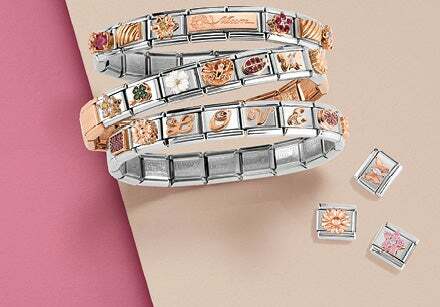 Among the offerings from Nomination you will find steel and silver rings embellished with romantic symbols in yellow or rose gold, sparkling stones and heartfelt engravings. Glamour stars, hearts or brilliant zircons? We have many offerings: all you have to do is choose the ring that will make your partner happy this Valentine’s Day! For this Valentine’s Day are you looking for a truly important piece of jewellery to make your loved one happy? If so, then the perfect piece of jewellery for her is a necklace with a pendant, which can be worn with the most casual outfits as well as the most chic. For Valentine’s Day 2019, we present a selection of necklaces that carry the most romantic symbols of love. A heart-shaped pendant can’t be missed, which can decorate long and flexible chains, made from silver and embellished with stones and brilliant details. Are you looking for a necklace that will light up the face of your girlfriend or wife with many brilliant lights? Choose one of our necklaces with a pendant adorned with zircons, for a precious accessory that can be worn on the most elegant evenings. Discover all of our Made in Italy necklaces, their refined designs and the precious materials with which they are made, for a truly unforgettable Valentine’s Day gift!